Waterfalls are a special part of nature. Each one is completely unique in the way that it flows and drops from its source. The Northeast Georgia area is filled with many beautiful waterfalls. Anna Ruby Falls is located near Helen, Georgia and is located in Unicoi State Park. This gorgeous waterfall is about 10 minutes from downtown Helen. 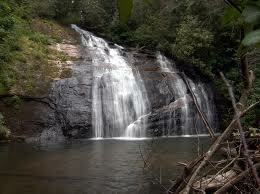 This is one of the most popular falls in the area and the road is paved from the entry. Anna Ruby has double falls and is a short half mile hike. This easy hike is recommended for families or those that have mobility issues. 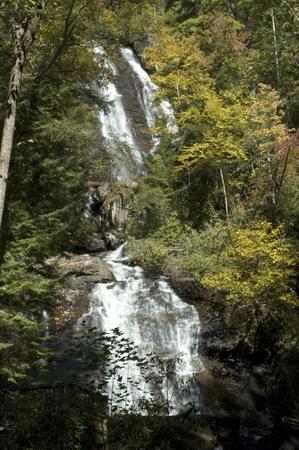 Raven Cliff Falls is a short drive from downtown Helen and off Richard Russell Scenic Parkway. These falls are gorgeous after a rainfall or anytime of the year. The hike is 5 miles roundtrip and takes three hours total to complete the hike and is a moderate hike. The hike results in a waterfall that drops about 30 feet. Along the way to the falls, you will see many smaller falls making this one of many beautiful hikes in the White County area. Dukes Creek Falls is also located off Richard Russell Parkway. This is a fairly easy hike that is 1.2 miles round trip over well maintained trailways. This hike is recommended for families or those that have mobility issues. 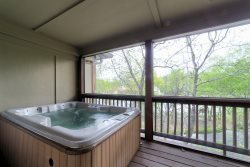 Three observation decks make sure everyone can have a view of the falls. 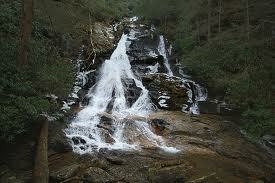 High Shoals Falls is located halfway between Helen and Hiawassee. From the trailhead it is a short 1.2 mile walk filled with local mountain flowers and occasionally wildlife. These falls result in water falling 50 feet to the pooling pond below. The pooling pond can be used as a wading area if one desires. Amicalola Falls is the start of the Appalachian Trail. Amicalola Falls are the largest in Georgia and are located in Dawsonville. This majestic wonder is 729 feet and there are four separate trails to view the falls. Each trail results in beautiful views. 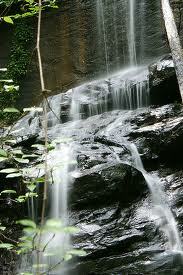 These falls are located on Amicalola Falls State Park and vary in difficulty from easy to difficult. 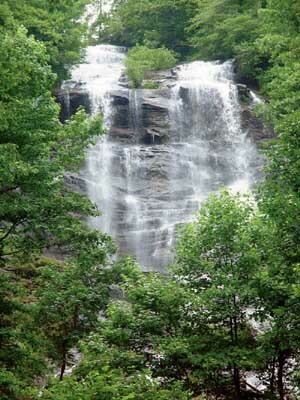 Desoto Falls are located in Dahlonega along Frogtown Creek. These falls are made of three parts. The upper part of the falls drops 200. The middle part of the falls drops 90 feet. The lower part drops 35 feet. The total height of the falls is 480 feet. The total roundtrip length of the falls is 2.4 miles. Helton Creek Falls is a series of two waters located in Blairsville, Georgia. This waterfall is near a mountain cove and is fed by Helton Creek. The total trail length round trip is 0.4 miles. This is an easy hike that is enjoyable by all. The height of the lower falls is 30 feet. The upper falls are taller (50 feet) but not as wide as the lower falls. There are many more waterfalls in the area. The ones listed above are some of the more popular falls. Directions can be picked up from our office to any of these falls.